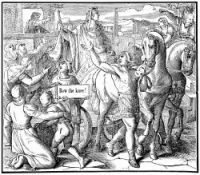 The period when Joseph was sold into Egypt must have been somewhere about fourteen hundred years before Christ. Joseph's first master, Potiphar, was a native Egyptian. It appears that Joseph dwelt in the home of Potiphar for a decade of more. Here he must have seen and studied all the ancient civilization and splendor of the Egyptians, and he gradually won the esteem and confidence of his master. From position of helpless slave, he grew to be chief steward and director of the entire household. Unfortunately, Potiphar's wife falsely accused Joseph of making advances towards her. He was stripped of all his offices and cast into prison. While in prison, he interpreted the dreams of the cupbearer and the baker. 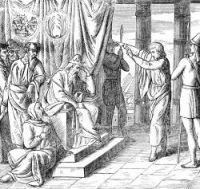 Finally Pharaoh himself called for Joseph to intepret two prophetic dreams that his own advisors could not decipher. Joseph intepreted them in the name of God, foretelling of seven years of plenty followed by seven years of famine. 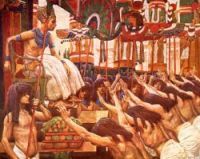 Pharaoh at once appointed Joseph governor of Egypt. 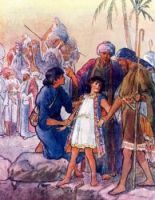 Joseph's first act was to travel through Egypt. During the seven plenteous years there was a very abundant produce, and he gathered the fifth part and laid it up in preparation for the lean years ahead. These drawings of Joseph in Egypt are from my collection of antique Bibles and story books. 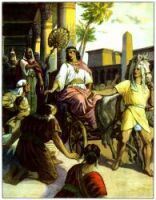 Feel free to use these illustrations of Joseph in Egypt in your artwork. Click on the Joseph Egypt images below to see more details about saving a free Joseph Egypt picture or about purchasing the images of Joseph in Egypt at a higher resolution.